Yacht detailing at its best! We offer monthly, quarterly and annual maintenance plans based on your needs including items such as washing, cleaning and interior prep. Your plan can also be as complex as a full annual maintenance schedule for your vessel. 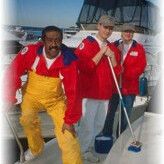 We also have the capability and “know how” to accomplish a wide range of “client directed” Yacht Management Programs.